Thematically, Europresse titles cover the Humanities and Social Sciences, Politics, Law, Economics, Finance, Science, Environment, IT, Transports, Industry, Energy, Agriculture, Arts and culture (Lire, Le Magazine littéraire, World Literature Today, Télérama, Rock and Folk), Health, and event Sports (L’Équipe, France Football, Sport 24). It also includes some TV and radio transcripts, biographies and reports, images, audio and video content. Europresse also offers access to English language titles from the UK (The Guardian, The Independent, The Economist, Financial Times) and the US (The New York Times, The Washington Post) as well as others from Europe (Die Tageszeitung), Africa (Africa Energy Intelligence, All Africa, Liberté –Algeria), the Middle East (Al Jazeera, Khaleej Times, Jerusalem Post), Asia (South China Morning Post, China Daily, Kabul Press) and Oceania (The Australian). Trial Access to Europresse for members of the University of Cambridge is available on and off campus at the following link from 22 January to 31 January 2019. You can select the language of the interface in English or French. ACCESS IS ENABLED FOR 2 SIMULTANEOUS USERS, SO ONLY TWO MEMBERS OF THE UNIVERSITY CAN USE EUROPRESSE AT ANY ONE TIME. THEREFORE, TO ENSURE THE ACCESS IS AS SMOOTH AS IT CAN BE AND EUROPRESSE IS USED TO THE MAXIMUM, PLEASE LOGOFF FROM YOUR SESSION WHEN YOU ARE FINISHED. This trial is enabled to obtain feedback from users to help the decision of the University Library on whether to proceed to subscription. Subscription access would also be enabled for 2 users only to access Europresse at any given time. Cambridge University Library now makes available newspaper archives online for the study of the history of Ireland and the Irish. Only the last week to two weeks’ issues are not available at any given time. The Irish Newspaper Archive comprises many newspapers, from national broadsheets to regional papers, some dating back to the eighteenth century, and is the largest such database available online. Titles include the Irish Independent (1905-current), the Irish Examiner (1841-current), The Freeman’s Journal (1763-1924), the Connacht Tribune (1909-current), the Meath Chronicle (1897-current) and the Southern Star (1892-current). A full list of coverage is available here. A poster for promoting the archive in libraries can be found here. 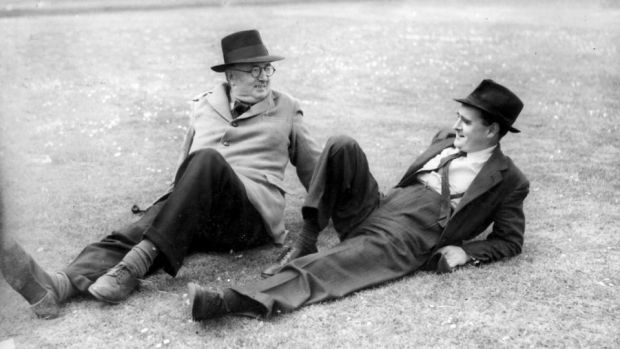 Contributors to the Irish Times: Brian O’Nolan (right), aka Flann O’Brien and Myles na gCopaleen, with the writer, playwright and National Gallery of Ireland registrar John Weldon, aka Brinsley MacNamara. Factiva is a business and news database of over 8,000 publications. Sources date from 1969 onwards and include full-text of many national and regional newspapers. Here is a quick guide on how to search for a specific article on this platform. Example article: Salt, J. and Clarke, J. 2005. Migration matters. Prospect Magazine. The search term in this case is “migration matters”. Note that the default date range is usually set to “30 days” . You can change this to “all dates” using the dropdown list. You can also choose the exact source you want to search by clicking on the blue triangle next to Source, which brings up a new search box. In this case you want to search the “Prospect Magazine”. Finally, we suggest using the search button at the bottom right hand of the screen in order to see the full range of results. The top search button does not seem to take all the search criteria into account. Click on the title “migration matters” for acces to full-text. Further information on how to use eresources@cambridge is available here.